One of the biggest problems on Steam comes in the form of review bombing. Users angry about content, design decisions, or business choices have been known to flood developers’ store pages and push down the user review metrics. Valve tried to fix the review bombing issue in 2017, adding graphs and alerts to sudden and drastic volume of reviews. This didn’t go far enough, with games like Metro 2033 and Metro: Last Light getting hit with a flood of negative reviews after Metro Exodus was announced as an Epic Games Store exclusive. In addition to recently announced features to combat review bombing, developers can now hit the alarm, a “Call for Help” button that rallies Steam support when a game is being targeted. In some cases, this won’t be necessary, as Valve is alerted and should respond when spikes like this happen. 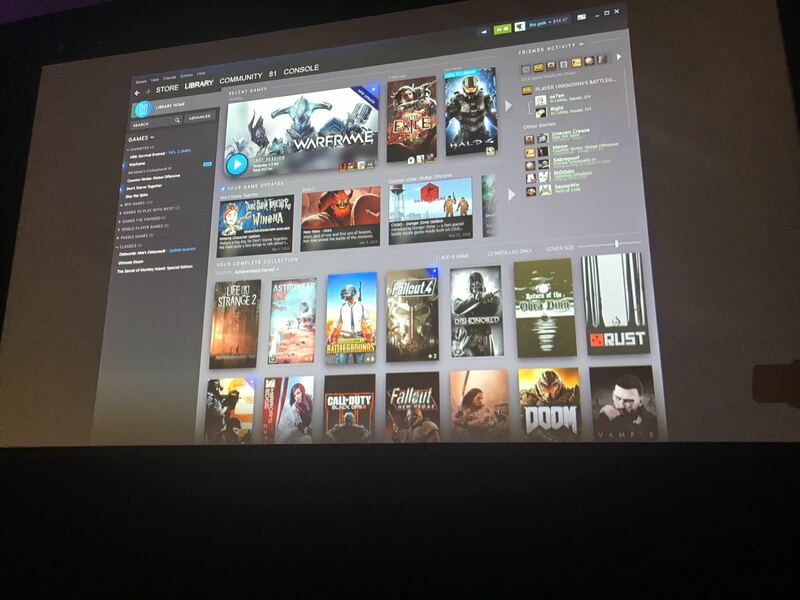 Steam is also planning major overhauls for user libraries. The library will have new search features and auto-grouping. For instance, if you create an RPG group in your library, the next time you purchase a game with similar tags, it will automatically be added. The library update will go into open beta this summer. Store pages will receive a similar update to match the look. These will include tie-ins to the new Steam Events system. This tool will allow developers to more actively engage those that follow and own their games, alerting players about limited time events like bonus weekends, livestreams, and tournaments. The events system is in closed beta now. Developers and users will have access to an open beta this summer. Where Steam worked to make its case with developers (without overtly addressing the revenue share gap) was in its technical presentation. Last week, Valve rolled out new APIs for Steam and non-Steam games to give developers access to its network. The network API hooks right into game code, and gives developers protection from DDoS attacks, hiding IP addresses and re-routing traffic over Valve’s backbone. The company touts 30 points of presence and 125 relays worldwide, with users automatically being routed from their ISPs to the nearest relay. This is the same network that Steam used to deliver 11 billion game updates and 13 exabytes of content in 2018. 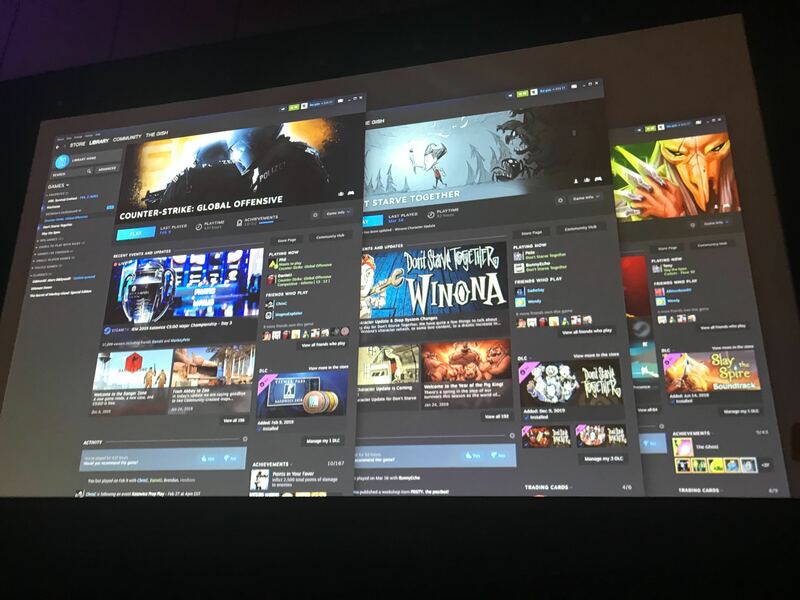 The Steam Network automatically prioritizes game data to insure constant connections and low pings without impacting content delivery, since live game data is typically small enough not to disturb multi-gigabyte downloads. Valve also leaned heavily on its global presence and more than 100 payment methods around the world. 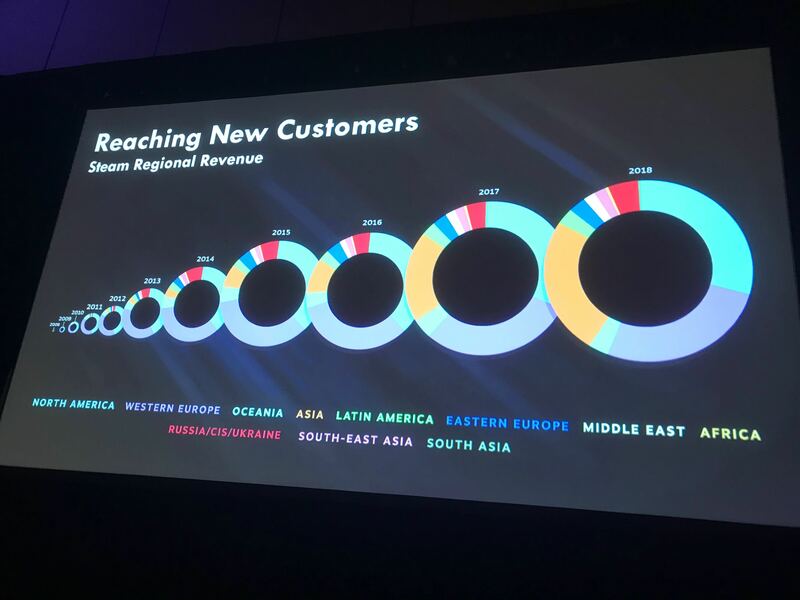 Epic is still spinning up its global presence and plans to add more currencies and payment methods in the next six to eight months, according to a recent roadmap. To drive home the importance to developers of adopting multiple currencies and payment methods, Valve’s Ricky Uy described what happened when the company entered the Japanese market. The reason for this? Customers wanted to pay in cash. This led Steam to introduce its pre-paid currency cards at retail. These are currently available in 50 markets, and they cost Valve 10 to 15 percent of the face value of the card. The company absorbs this cost rather than passing it onto developers. Today, 12.5 percent of payments in Asia are collected via Visa, MasterCard, American Express, PayPal, and Paysafe (methods considered common around the world). The remaining 87.5 percent of Asian revenues are collected via more than 90 other methods. Uy believes that breaking down payment barriers allows developers access to a broader consumer base in markets around the world. To explain the importance of embracing new territories early, Valve showcased its presence in Russia. That territory was growing slowly, and it was clear there were some barriers to delivering games to customers. Today, there are more Russian Steam customers than there were total purchasers in 2010. 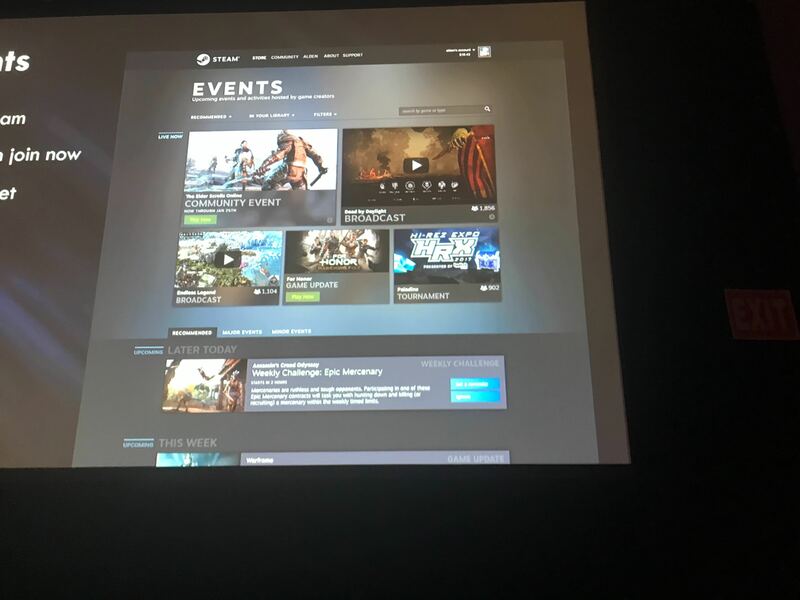 While other storefronts, including Epic Games Store, were completely absent from the talk, Valve seems to be stepping up its pitch to developers. The pressure isn’t letting up, though. Epic announced a number of exclusives at its keynote this week. We expect this pressure to continue until Steam relents and improves its revenue share with developers. At its own store update session at GDC, Epic expressed remorse over how the Metro Exodus exclusivity dealplayed out. According to one attendee, Epic said things were “worse than they thought” and that they “would never want to do that again,” suggesting consumer blowback was significant. Epic also said that its rush for exclusiveswon’t last forever. The company expects that over time, especially as other stores match its revenue share structure, developers will naturally consider Epic Games Store a key destination for release. The battle between Epic and Steam is long from over. The two companies aren’t even speaking the same language to developers yet. Epic led with financial incentive. Valve continues to attempt to justify its 30 percent take. 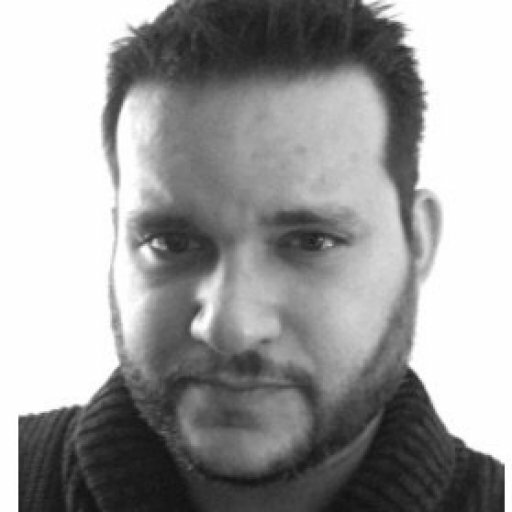 Something is going to have to give, because developers will understandably want the best of both worlds.